As I sit down to type up the recipe for these baked stuffed apple parfaits (I really love these as a quick, sweet, nutrient-rich breakfast or snack), I’m looking at my napping beagle Calvin and cracking up. 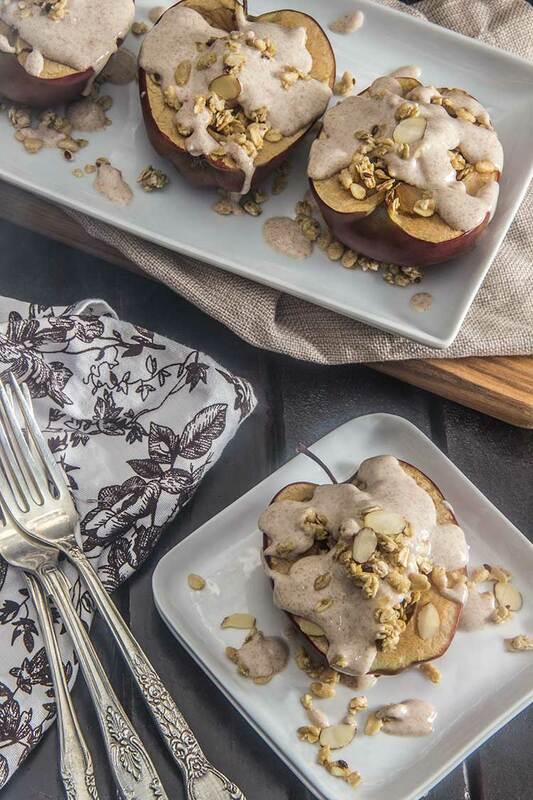 Because, as much as I love these baked apples, this recipe is most certainly not Cal approved. My beagle has an appetite that boggles the mind- he regularly cries for food immediately after finishing a meal. But he turns his nose at apples. “Foods” earning Cal’s Seal of Approval for Deliciousness: tissues, acorns, hockey gloves. Not on Cal’s approved list: apples. Okay, so I admit this dish is not approved by one furry member of the family. But, with sweet apples, crunchy granola, and yogurt flavored with maple, vanilla, and cinnamon they are really scrumptious in my mind. These “parfaits” are light (about 230 calories each) and full of healthy nutrients (tons of detoxifying Vitamin C, filling fiber, and energizing Vitamin B6). This dish is also very simple prepare (ready in about 20 minutes), but the sweet, full, oven-baked flavors make them feel like a really special treat. Halve each apple, slicing from stem to bottom. 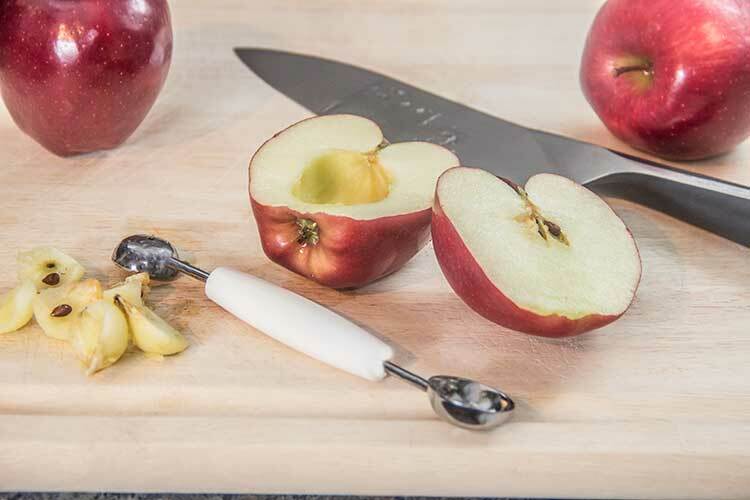 Use a melon baller or pairing knife to hollow out the center of each apple half, removing core and seeds. Arrange apple halves on a baking sheet or casserole dish, skin-side-down. Allow them to bake until softened, about 15 minutes. Meanwhile, add the yogurt, maple syrup, vanilla, and cinnamon to a bowl. Stir until well combined. Fill each apple with spoonfuls of the yogurt mixture. Top with granola. Serve warm. …Begin with these ingredients – – this is such simple dish! Next, grab some apples with natural sweetness, such as Honeycrisp or Cortland. Then grab a mellon baller or pairing knife to hollow out the center of each apple half, removing the tough core and all of the seeds. 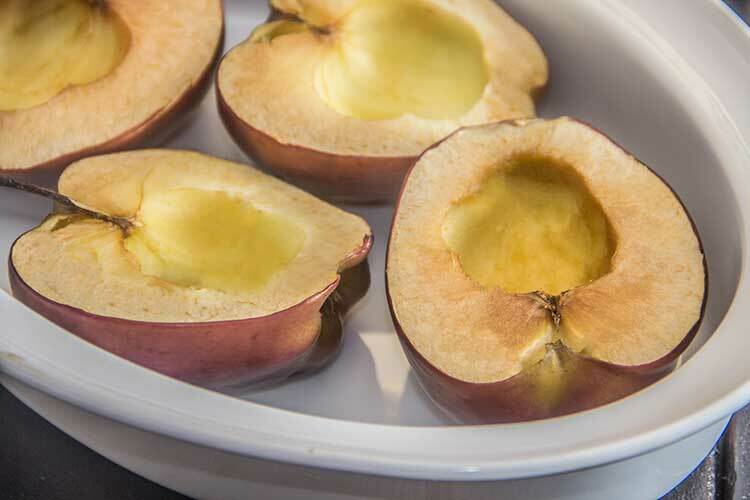 Next, place the apples on a baking sheet or in a casserole dish , skin-side-down, and toss them into the oven until the tops are golden and the apples are softened. Meanwhile, as the apples are baking away, prepare the flavored yogurt. 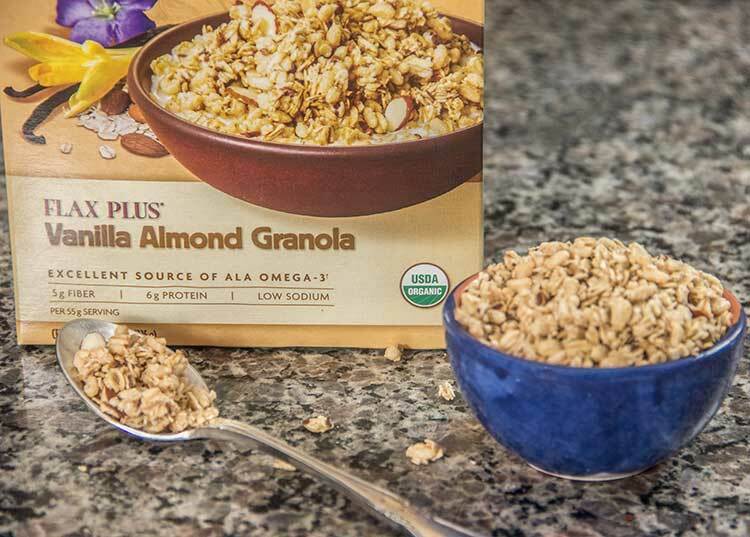 Grab some certified organic plain Greek yogurt and add it to a bowl. Also add 100 percent pure maple syrup (100 percent pure means that it’s all-natural, with only one ingredient: real maple syrup!) to give the yogurt some sweetness. 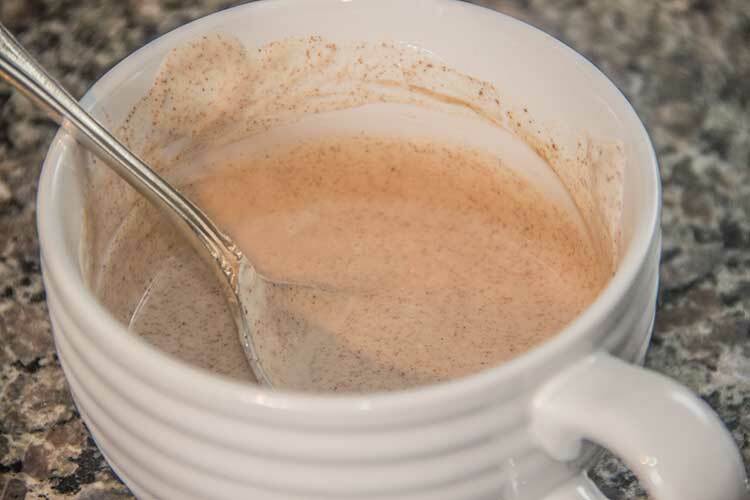 I also love to add a bit of vanilla extract and ground cinnamon – – they really flavor the yogurt and are so perfect with baked apples. 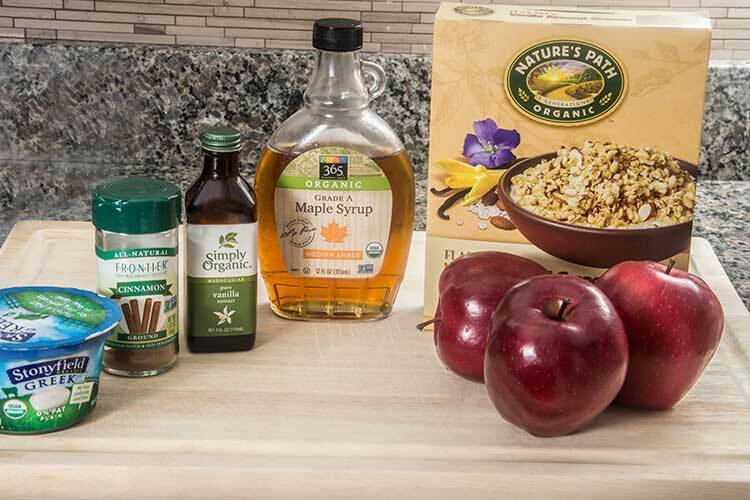 Also grab some granola in a flavor that complements the apples and yogurt, such as vanilla, almond, or cinnamon. For this recipe, I used Nature’s Path Organic Vanilla Almond Flax Granola , which is such a yummy flavor complement. 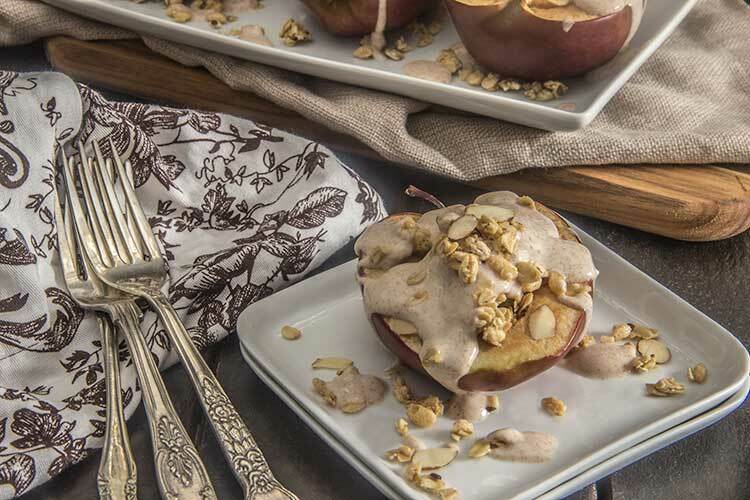 When the apples are baked, fill each one with spoonfuls of the maple vanilla yogurt. Top with granola, and serve! The apples are soft and warm from baking, and the sweet flavors of maple, cinnamon and vanilla really shine through in the yogurt. And the granola adds a tasty crunch. It’s a quick, simple snack or breakfast that feels indulgent and special. This is a fantastic idea! I love the use of apples as the ‘shell’ of the dessert! Wow! These sound amazing and so easy! This is definitely another one of your recipes that I’m going to have to try.